Maumee BM is located just east of Means Lake in the broad Johnson Valley of the Mojave Desert. Rural homesites are scattered along SR247 which runs through the area north of the San Bernardino Mtns, much of the surrounding land managed by the BLM. Johnson Valley is termed a BLM "Open Area" which means OHVs can pretty much go where they like. Means Lake itself is ground zero for the annual King of the Hammers competition, a combination of high speed cross-country travel and ultra low gear rock crawling. This is not the sort of place the Sierra Club would plan an outing and Zdon conveniently ignores the entire area in his Desert Summits book. But there are a number of P1Ks, range highpoints and other destinations of interest to the determined peakbagger. On my way from San Jose to Joshua Tree, it seemed a good spot to take a break after 6-7hrs of driving. The access off SR247 is Boone Rd, well-signed for the Johnson Valley Open Area. A good sand/gravel road reaches nearly to dry Means Lake and I was able to drive the van even further to the north end of the lake. 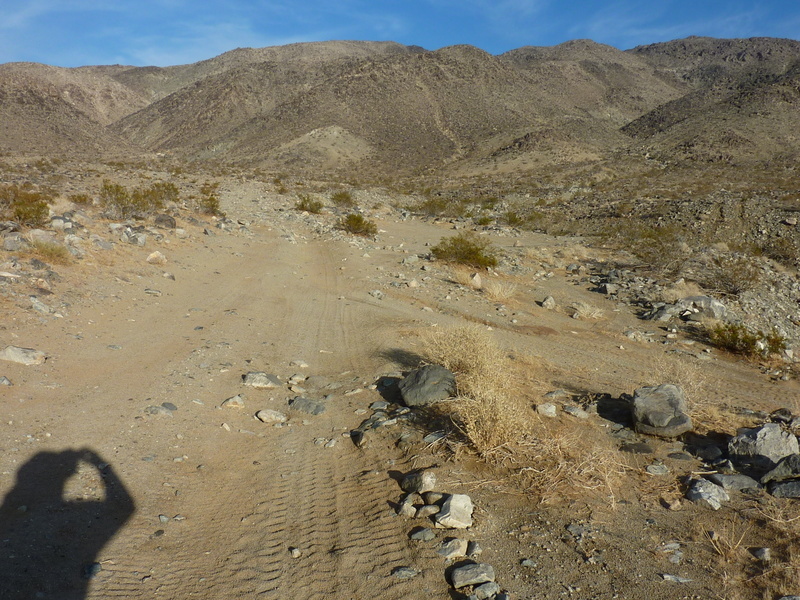 Heading east, the road devolves into a variety of OHV routes, causing some concern as the one I traveled grew progressively sandier. It helped that recent rains had left the ground damp and the sand firmer than it might otherwise be, but I stopped before getting myself into trouble, about 3.5mi from the summit. it was the first of a six-day roadtrip and it seemed prudent not to push the van on the first day. A couple of motorcyclists were camped at the northwest end of the lake with their gear and a larger commercial group further south, but I would have the route to Maumee to myself and only heard their motors across the desert in the far distance. The route to Maumee is pretty straightforward - in fact any of numerous routes could be used to equal effect. I followed a branch of the road I had been driving as it continued east through a of low hills and into a rocky wash before ending up against the base of Maumee's west side. From here I hiked directly up some 1,000ft over relatively easy terrain to the summit. I passed over an OHV road high on the mountain, just below the summit. It was impressive that vehicles could get up here (this was before I knew about the King of the Hammers event and what sort of vehicles play around in these hills). It took about an hour and quarter to reach the top around 3:30p, leaving me just over an hour of remaining sunshine. Lingering clouds from the passing storm made for picturesque horizons in all directions. A register left by John Vitz in 2006 had only a handful of entries since then, though oddly I was the third visitor in 2014.